After nearly two decades of drought in Sistan and Baluchestan province in southeastern Iran, with the beginning of rainy season in neighbouring Afghanistan, flood waters have filled some parts of Hamoun international lagoon, and that has resulted in the revival of livestock and plant species in the wetlands. The size of this species is usually up to 6 centimetres and is reported to be up to 11 centimetres in normal conditions. Due to its high tolerance in hard environmental conditions, including extreme temperatures, acidity of soil texture and long droughts, it has been able to form cysts to continue to survive under mud and freshwater beds. In the event of the provision of bio-nutritional conditions, it will resume its growth stages within two weeks and continue for up to 90 days. 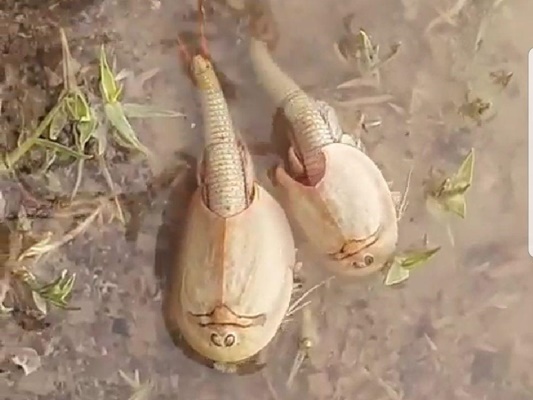 Although members of the genus Triops usually have no economic importance, some variants of them has been used to control mosquitoes and weeds.